Previously we have seen the glories of srIvaishNava thiruvArAdhanam and steps to perform the same at http://ponnadi.blogspot.in/2012/07/srivaishnava-thiruvaaraadhanam.html. The article, while quoting several slOkams and pAsurams, was missing full reference/listing of the slOkams. This article is aimed at providing that missing information. Best efforts have been made to collect all the slOkams/pAsurams that are used in thiruvArAdhanam. Please read on to see the full listing. rahasya thrayam, etc., are to be recited only after pancha samskAram. vEdha manthrams (including “Om”) are to be recited only after brahmOpadhEsam (which is done as part of upanyana samskAram). Only exception is for thirumanthram which is part of manthrOpadhESam in pancha samskAram. After taking bath one sits in a clean place and applies Urdhva puNdram reciting the following manthrams. 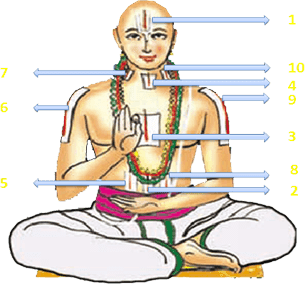 12 puNdrams are to be applied at the specified places first followed with srIchUrNam in the same spots. Urdhva puNdram should be applied after being comfortably seated on the ground/floor. Remainder of thirumaN (holy soil) and srIchUrNam in the hands should not be washed away. Instead, it should be wiped off on the head. Ideally, thirumaN should be applied with index finger (no tools should be used). During (death related) Asoucham, thirumaN is applied, but srIchUrNam is skipped. Local customs can be enquired from elders and followed. 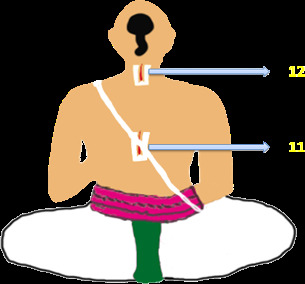 After applying Urdhva puNdram, guru paramparai is recited in manthra format as well as (a simple to remember) slOkam format. Both are listed below. After reciting guru paramparai and meditating on that, we recite rahasya thrayam - the three confidential manthrams. After rahasya thrayam, pUrvAchArya thaniyans are recited starting from periya perumAL to maNavALa mAmunigaL. After this, ones own AchArya's mutt/thirumALigai paramparai thaniyans are recited. Subsequently one performs sandhyA vandhanam and mAdhyAhnikam (thiruvArAdhanam is to be performed around noon time after mAdhyAhnikam). Note: during the time between morning anushtAnams and thiruvArAdhanam one could have been contaminated - so this purification step. Note: Starting at this point dhivya prabandham pAsurams are recited regularly. During anadhyayana kAlam, we recite upadhEsa raththina mAlai and thiruvAimozhi nURRanthAdhi pAsurams in place of dhivya prabandha pAsurams. pOdharumA polE nI pUvaip pUvaNNA! Open the doors of the sannidhi clapping the hands 3 times at this point. Perform snAnAsanam - Recite purusha sUktham, nArAyaNa sUktham, vishNu sUktham, srI sUktham, bhU sUktham, nILA sUktham, periyAzhwAr thirumozhi veNNeyaLaintha kuNungu padhigam - as much as time permitting. After this sEvAkAlam starting with common thanians and as much pAsurams recitation possible. Prepare bhOgam (food) and offer to perumAL, thAyArs, AzhwArs, AcharyAs. Finally, offer the bhOgam saying "adiyEn mEvi amarginRa amuthE! ArAvamuthE amudhu seytharuLa vENdum" (4 times) - I am offering this nectar! Oh dear unexhaustible nectar (bhagavAn), Please mercifully accept this. 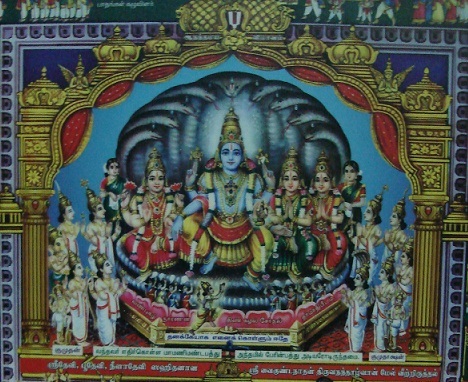 Recite mangaLa slOkams (for perumALs, ANdAL, nammAzhwAr, thirumangai AzhwAr, emperumAnAr, mAmunigaL and all AchAryas mangaLa slOkam). Please refer to https://guruparamparai.wordpress.com/mangala-slokams/ for full listing. Recite OrAN vazhi AchArya vAzhi thirunAmams and vAzhi thirunAmams of any other AzhwAr/AchAryas having their thirunakshathram on that particular day. 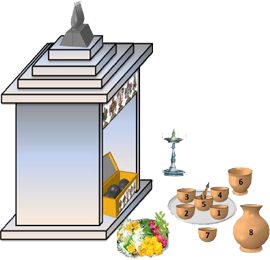 Please refer to https://guruparamparai.wordpress.com/vazhi-thirunamams/ for full listing.